Income Tax: How reachable is zero-tax income level of Rs 5 lakh using deductions, exemptions? Business News›Wealth›Tax›How reachable is zero-tax income level of Rs 5 lakh using deductions, exemptions? Someone earning Rs 9.75 lakh a year will find it difficult to claim all these deductions without drastic cuts in the lifestyle. Articles in the media and analyses on TV seem to suggest that even individuals earning up to Rs 8-9 lakh a year will not have to pay any tax if they claim deductions by investing in specified instruments. However, these are hypothetical numbers that do not reflect reality. Someone earning Rs 9.75 lakh a year will find it difficult to claim all these deductions without drastic cuts in the lifestyle. Anjali Behl has not been able to hide her excitement since the Budget was announced on 1 February. “My net income after all deductions will be below Rs 5 lakh, so I won’t have to pay any tax next year,” chirps the Delhi-based assistant manager. She is not alone. The full tax rebate for incomes up to Rs 5 lakh a year will put an estimated three crore taxpayers out of the tax net in 2019-20. Or will it? Articles in the media and analyses on TV seem to suggest that even individuals earning up to Rs 8-9 lakh a year will not have to pay any tax if they claim deductions by investing in specified instruments. If an individual invests Rs 1.5 lakh under Section 80C, pays Rs 2 lakh interest on a home loan, contributes Rs 50,000 to the NPS and buys a health insurance plan for Rs 25,000, his total deduction will come to Rs 4.25 lakh. 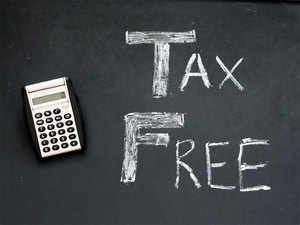 Add the Rs 50,000 standard deduction and even an annual income of Rs 9.75 lakh can be tax free. In other words, someone earning Rs 81,250 a month will not have to pay any tax. “Ensuring that your net taxable income stays within the magic figure of Rs 5 lakh will not be an easy task,” says Archit Gupta, Founder and CEO of tax filing portal Cleartax.com. For one, if one pays an interest of Rs 2 lakh on a home loan, the total EMI burden works out to more than Rs 3 lakh a year. If you add the burden of tax saving investments and medical insurance, the individual will be left with less than 50% of his gross income for running the household and other expenses. Rejigging the pay structure is one way an individual can get into the no-tax zone. Last year’s Budget had removed the tax exemption for medical reimbursements and travel allowance. But several other perks are still available. The leave travel assistance and reimbursements for fuel and car lease are among the tax-advantaged perks that companies can use to bring down the taxable component of their employees’ salaries. Of special interest is the NPS benefit under Section 80CCD(2). Under this, up to 10% of the basic salary contributed to the NPS on behalf of the employee by the employer is tax free. Now that 60% of the NPS corpus has been made tax free on maturity, it makes more sense to invest in the low-cost pension scheme. “Employees should negotiate with their companies to offer the NPS benefit which can cut their tax significantly,” says Gupta of Cleartax. However, even if the taxpayer manages to squeeze out the maximum deductions by tightening his belt, he may still miss the rebate. There are a lot of misconceptions among taxpayers about what constitutes their total income. “Taxpayers rarely estimate their annual income correctly. Most have a rough estimate based on their cost-to-company (CTC) figure. But the CTC may be different from what you actually earn,” says Gupta. For instance, interest from bank deposits, recurring deposits, corporate FDs and National Savings Certificates is fully taxable. Even if it is a cumulative fixed deposit and the investor doesn’t receive interest till the deposit matures, he will be taxed for the interest accruing every year. The interest is added to his total income and gets taxed at the marginal rate applicable to him. But if taxpayer neither has home loan nor pays rent, income will exceed But Rs 5 lakh limit and he won’t get rebate. But if taxpayer is not able to save more or has high income from other sources, total income will exceed Rs 5 lakh limit and rebate will vanish. But rebate possible if taxpayer cuts other income by investing in tax deferred options and claims more for medical insurance. However, most taxpayers do not report interest income in their tax returns. “Almost nine out of 10 taxpayers don’t report any interest income when they file returns,” points out Sudhir Kaushik, Co-founder of tax filing portal Taxspanner.com. This is surprising, since many people (including Anjali Behl who has about Rs 11 lakh in fixed deposits) have bank deposits and Post Office investments. Besides, all taxpayers have bank accounts and the balance earns interest. This interest is tax free up to Rs 10,000 a year under Section 80TTA but any amount beyond that limit is taxed as income. The Budget has also proposed to raise the TDS threshold from Rs 10,000 to Rs 40,000 a year. If an investor earns up to Rs 40,000 on deposits in a year, there won’t be any TDS. This proposal is being wrongly construed as an opportunity for investors, which in turn has spawned the misconception that no tax is payable if bank has not deducted TDS. Keep in mind that whether the bank deducts TDS or not, your tax liability does not end there. Interest continues to be fully taxable and you will have to pay tax on interest earned even if there is no TDS. Is there a way to prevent interest from pushing up your taxable income? Instead of paying tax on interest every year, investors can go for tax friendly instruments such as debt funds and fixed maturity plans (FMPs). Here, an investor is taxed only when he sells the funds and realises the gains. If he holds the investments for less than three years, there is no difference in the tax treatment. The gains from the sale of non-equity funds held for less than three years are treated as short-term capital gains. They are added to the income of the taxpayer and get taxed at the marginal rate. But if he holds for over three years, the gains are treated as long-term gains and get taxed at 20% after indexation. Indexation takes into account the inflation during the holding period and accordingly adjusts the purchase price upwards to bring down the tax liability. Another common mistake which can push up your taxable income is investing in the name of a non-working spouse or minor children. Money gifted to a spouse or a minor child does not attract tax. But if that money is invested, the income it generates is clubbed with the income of the giver and taxed accordingly. If a husband has invested in fixed deposits in the name of his wife or minor child, the interest will be taxed as his income. Mutual funds and Ulips can rescue the taxpayer from clubbing. Income from Ulips is tax free so it will not affect the tax liability of the investor. If you invest in mutual funds in the name of a minor child and withdraw only after he turns 18, the gain will be treated as his income, not yours.